One of my husband's favourite chocolates is Toblerone so for Fathers' Day I wanted to make a Toblerone cheesecake for our family lunch. I also recently welcomed a Thermomix into my home, so I wanted a thermo-friendly recipe. 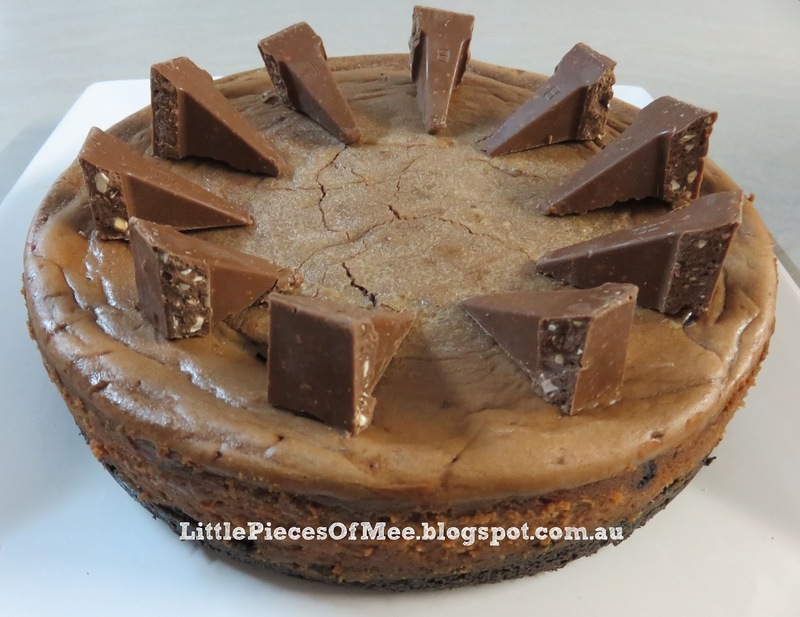 A quick searching revealed a recipe for a baked chocolate cheesecake that looked amazing, and a no-bake Toblerone cheesecake that had Thermomix directions. I prefer baked cheesecakes over no-bake ones so I decided to combine the two recipes. The result was a rich and decadent cheesecake with a very deep chocolate flavour and a divine texture. This is probably one of my all-time favourite cheesecakes (which is saying a lot as cheesecake is my favourite food), but its definitely one of those recipes to keep for special treats. Note: if you want non-Thermomix directions, use the recipe at Oh Sweet Day - I just doubled the quantities for my 24cm springform pan. Grease and line a 24cm spring form pan. Place chocolate cream biscuits into Thermomix bowl 10 sec/speed 8. Remove from bowl and set aside. Press biscuit mixture into the base of the springform pan and bake for place 8 minutes. Set aside to cool. Turn down oven temperature to 140°C. Pour chocolate mixture over biscuit base and bake at 140°C for approx 45 mins or until the edge of the cheesecake is puffed but the centre is still wobbly and wet looking. Chop extra Toblerone triangles in half and arrange on top of cheesecake to serve. I have three gorgeous kids and love to create handmade cards, yummy food and cute crafts.